This was all done at Cannon’s Inferno in Twilight Highlands. I was able to make about 2500 gold for an hour of grinding and fishing in one spot. Note: Bring your fishing pole. 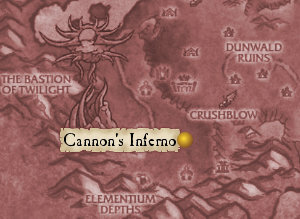 The mobs we want to kill are the Enslaved Infernos which drop Volatile Fire. The first time I came here and starting killing the Infernos I found I quickly ran out of them and was waiting around for respawns, hardly good for a high gold/hour or drop rate. There is one thing we can do while we wait for respawns is fish for Volatile Fire from Pool of Fire. 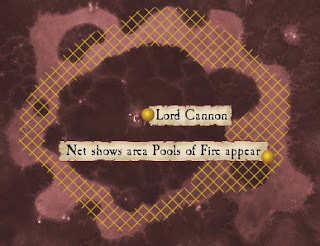 Four different pools of fire spawn around in the lava that fish a volatile fire every time, you can get anywhere from 1-3 volatile fires per cast and can cast 3 times on the same pool. So you could potentially get 9 volatile fires per pool x 4 pools = 36 volatile fires in about 5 minutes! The pools of fire seem to be on a 5 minute respawn timer. You can tell where a pool is when there is flame coming up from the lava, don’t be fooled by the flames that are on the edges of the lava and rock as those are not pools. These pools also show up if you use the track fish which can be gotten from the weather beaten journal at fishing level 100. The best part is that there is no required fishing level to fish the pools, you can do it right from level 1 as long as you have a fishing pole with you. I farmed this spot for an hour, making sure I first fished the pools to start their respawn timer then I proceeded in killing all the Enslaved Infernos, even the 3 spawns that are over the hill, there would be about a 1 minute wait time for respawns then the whole cycle would repeat again. In an hour of farming this spot I was able to get 104 Volatile Fires. Ive been looking for a spot to farm this stuff. This is god to know if you need money. good info, pretty cool post. Wicked! I'm totally thinking of starting it up. Sounds pretty easy to get some cash there. Seriously? Thanks like amazing! Great idea, thanks!